It’s the song that will never end. This week, those who predicted that this dispute would end in a trade war will feel a twinge of gratification: India has threatened to ban European airlines from Indian airspace if the Europe Union begins to impose sanctions on Indian airlines. Last week, both the Chinese and Indian governments forbade their airlines from providing the EU with data on their carbon emissions, signaling that this situation is not going to be resolved amicably anytime soon. The EU now seems to have backed off, to some extent, from the tough talk and complete refusal to back down. A spokesman for Connie Hedegaard, the EU climate commissioner, stated that the UN’s International Civil Aviation Organization was hoping to reach a mutually agreeable solution prior to April of 2013. It remains unclear what this solution will involve, as India and China have shown little interest in international negotiations to limit their economic growth through carbon taxation. 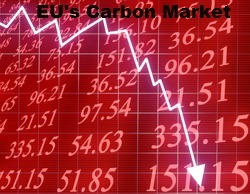 The European Union’s carbon market has seen brighter days. Last month, EU carbon prices fell to a record low of €6 per tonne (~$9.5/ton) from an initial high of €18 per tonne (~$28.5) in early 2011. In response to these low prices and “excess” permits, the Bavarian stock exchange announced this week that beginning July 1 it will abandon its carbon emissions trading operations, also attributing the Euro-zone debt crisis as a contributing factor. Head of the exchange Christine Bortenlaenger noted: “Emissions trading will never find its feet again without radical political action.” In the midst of the European debt crisis, it is unclear if the political will exists within the EU to make significant changes to the program, especially given the number of industry stakeholders who are happy with low prices.